Now you can buy the Playstation Network Cards at the best price on the Internet, thanks to the selection of the best online stores available. 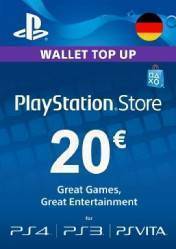 PlayStation Network Card 20 € DE (Germany) is the easiest and fastest way to add 20 euros into your Playstation Network account, with which you can buy games, movies, bonus and songs quickly and easily. This prepaid card is only valid for Germany accounts or within the territory of German. Remember that all stores appearing in the list of Gocdkeys have been and are periodically reviewed by our team and our users, so they are totally reliable. You can view the assessment and comments from each store on the link "+ info" right next to the shop name. There are no comments yet about PlayStation Network Card 20 EUR DE . You can be the first one!